Hurricane VH-JFW pictured the day prior to it's first post-restoration flight. Hawker Hurricane, Serial No 5481 C/N 60372, C-FDNL, Mk XII / IIB arrived in Australia on the 7th of April 2014 from Canada after a lengthy boat trip via the Panama Canal and New Zealand. The aircraft has undergone an extensive refurbishment program by Vintage Fighter Restorations at Scone, NSW. Following a full inspection and survey of the aircraft, the decision was taken to send the fuselage to Matt Webber and the team at Luskintyre Aircraft Restoration to have the fuselage woodwork refurbished and new cloth added to the fuselage. The work was extensive, with the rear upper cockpit framing rebuilt including new stringers on the fuselage. A new fabric “bag” was then fitted to the fuselage and then the doping of the fabric and finally the painting of the structure followed. After the return of the fuselage assembly to Vintage Fighter Restorations at Scone, a large program of work ensued to refurbish the rest of the aircraft including the hydraulic and electrical systems and any worn items were replaced. The wings were fully inspected and made ready for repaint. The Hurricanes Rolls Royce Merlin 500/224 engine was found to be in excellent condition and required very little attention other than maintenance. The engine remains in the red color finish of a previous restoration in the UK with the belief that it will be easier to determine the source of oil or coolant leaks. In early 2016, the majority of the airframe had been refurbished and the wings refitted to the aircraft. 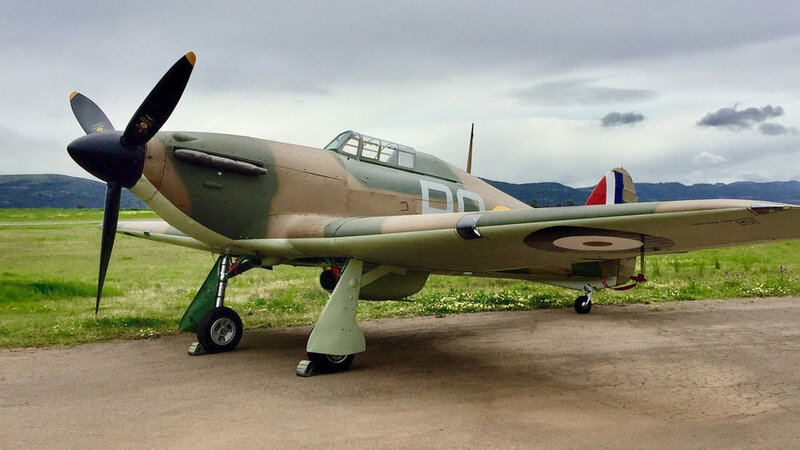 The Hurricane was moved to the paint shop at Vintage Fighter Restorations, where the camouflage and aircraft markings were applied. The colors and marking applied to the aircraft are extremely detailed and were researched as closely as possible to represent the aircraft of John Dallas Crossman, an Australian who flew with No 32 Squadron and No 46 Squadron and was killed on the 30th of September 1940 at 13:30hrs. He was shot down in his Hurricane I (V6748) at Forest Row, Sussex by a Messerschmitt Bf 109E. Vintage Fighter Restorations arranged all the appropriate inspections and reports to be carried out and filed with the appropriate authorities for its first flight in Australia on 2nd of October 2016 at Scone NSW by pilot Ross Pay. The flight commemorated the last flight of P/O Crossman 76 years and 3 days earlier in the original Hurricane I (V6748). The Hurricane remains at Scone NSW in the care of Vintage Fighter Restorations. Fuselage undergoing restoration of the wooden structure. VH-JFW airborne for it's first post-restoration flight. Ross Pay makes the first Hurricane flight in Australia since WWII. Hawker Hurricane Mk XII, Serial No 5481 C/N 60372 was manufactured by Canadian Car and Foundry (CC&F) of Fort William (Thunder Bay) in 1942 based upon the Hawker Hurricane II version from the UK with the 12 Browning 303 machine gun wing. The aircraft served with various RCAF Squadrons including 31 Operational Training Unit (OTU), 1 OTU and No. 9 Bombing & Gunnery School from July 1942 until it was struck off charge in November 1944 and disposed of by Crown Assets in Canada. The aircraft was then said to be stored in a field and survived the horrific Canadian winters in relatively good shape. At some stage in the mid-1980s the Hurricane was purchased by Canadian Warbird salvager Jack Arnold in Brantford, Ontario and some restoration was attempted. In 1984 the Hurricane moved on to Terry Dieno of Davidson, Saskatchewan who also continued to rebuild the Hurricane. The Hurricane was later passed on to famous UK based collector Charles Church in 1986, who initiated the full restoration of the Hurricane by Paul Mercer. 5481 made its first post-restoration flight in September 1991 marked as P2970 "Little Willie," the Mk.I flown by Pilot Officer Geoffrey Page of No. 56 Squadron RAF on the occasion that he was shot down in August 1940. The Hurricane then passed on to the USA when purchased by David Price in 1991, following the tragic death of Charles Church in 1989. The aircraft arrived in the USA in 1992 and was first flown at Chino California joining the fleet of Warbirds at the Museum of Flying (MoF). With the closure of the MoF in 2002, the Hurricane was sold to Ed Russell and added to his collection in South Niagara, Ontario. In 2014 after advertising the aircraft for sale it came to new owners at Scone and was placed into the hands of Vintage Fighter Restorations at Scone, NSW. Although the Hurricane is an Mk XII, it is finished as stated above as an Mk 1, V6748 of No 46 Squadron, flown by Battle of Britain pilot, John Dallas Crossman. Crossman was born in Mossman Qld on March 20 1919. Educated in Newcastle NSW, Crossman lived in Waratah, a Newcastle suburb. The scheme was specially chosen to honour the pilot who was from the NSW Hunter Valley region of Australia, close to Scone, the new base of the aircraft. Crossman was buried at Chalfont St Giles Churchyard, Buckinghamshire, United Kingdom, Grave 13.